I love cooking and Im pretty good at it and as I’m preparing salad(see below), it hit me. Eureka! Blog inspired!-how to make a good salad and when to eat it! Well I maintain that a hearty salad laden with all the good stuff, can be the centerpiece of not only a side dish but an entree!. 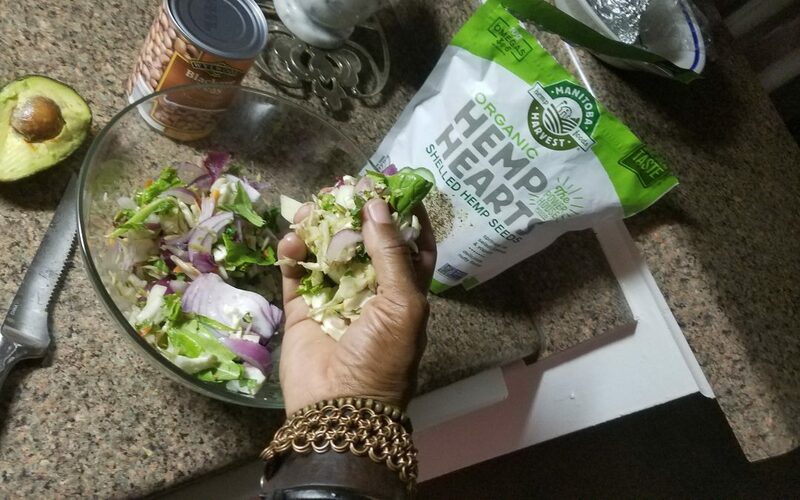 It can be a very satisfying dish especially for those that are in keto,, low carb, vegetarian eating modes.. One of the most important benefits are antioxidants, energy, cellular restoration, weight loss, muscle retention, skin health, hair, nails. etc. So I’m gonna share my suggestions for a quick healthy crunchy meal!! I love how the food industries have made preparing food easier, especially with Salad Chopped.Kits. You can got to ANY grocery store and find prepared salad. Its a good start and also makes you compliant when you KNOW you need to eat this stuff but don’t feel like making it! But its a ‘no brainer’! I promise. Check it out! Making my fave salad. You can add tomatoes, black olives, artichokes, or red /white onion, Granny smith apple slices or any nuts are AWESOME on this! 1 bag of bag salad FRESH EXPRESS CHOP KIT KALE is excellent, but any will do. The salad is already ‘shredded’ cabbage kale,broccoli, shredded Brussels sprouts, & radicchio. BOOM! Now you KNOW we are not going to buy all those veggies, wash’em, chop’em to make one salad!! It’s already done for ya! (damn I love this). The other benefit is there is no waste. If you had bought all those veggies, and you did not prepare a salad frequently enough, they would over ripen, ultimately spoil and be disposed of. 1/2 cup BEANS...any will do, I love black eye peas, garbanzo[chickPeas], and black.Rinse beans to wash off salt or buy low sodium beans. 1/2 AVACADO..because FAT is good! This is one of many healthy fats and quite versatile. It’s gaining such popularity that you can find them at ANY grocer. How to tell you got a ‘good one’: ‘flip’ off the little nub of stem. If its green where the stem was,then it’s good but to hard to eat. If store outside fridge, will ripen 2-3 days, in fridge 3-5 days.If stem area is ‘light to medium brown’ can eat right away. If black it is ‘over ripen’ DO NOT BUY this. I have tried two ways to keep unused ‘cado’s’: squirt lime juice on unused portion,wrap in aluminum or place unused portion in whole milk. I prefer the lime, but use it within 2 days. 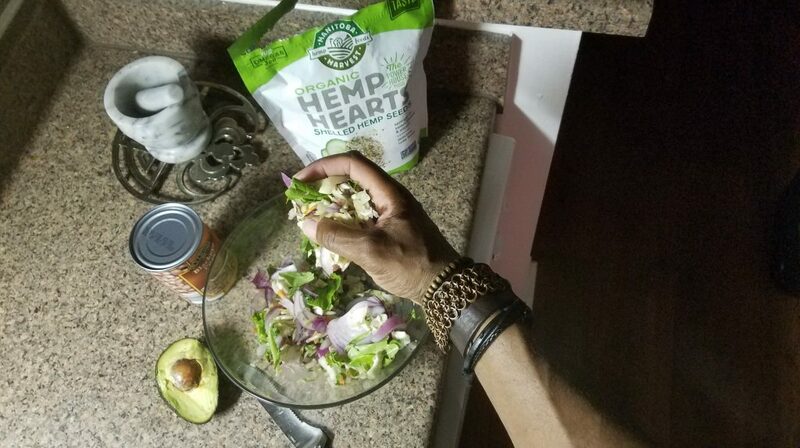 1/2 CUP HEMP HEARTS...Yeah. Hemp. Thanks Woody Harrelson! (Beast mode in ZOMBIELAND!) and he helped bring it into vogue.He was smoking it though. So. Yeah..but still..). This is my new fave over chia seeds. Heres why: the flavor , 70%more iron, 2xmore protein, 25% more Omegas 3 & 6 and did I say the flavor is nutty. I put this in my paleo waffle mix, over sauces, etc.. Most of the chop kits come with dressing and topping i.e croutons, nuts, dried berries. I suggest not using the croutons or use sparingly. Nuts and berries for sure. Now you got a salad that is SO hearty and tasty. Of course you could add salmon, tuna, chicken, beef and you got yourself a meal! Oh damn! Almost forgot. I love multi grain Wasa bread as in accompaniment. Its a hearty Kosher cracker. Remember when Andy Griffin did those “everything taste great on a Ritz?” Well this cracker is so hearty I’ve used it in place of taco shells (you can top Wasa with taco filling)! this is an aside but one of my fave snacks is to spread a Wasa cracker with cream cheese, a few slices of avocado and tomato. :Three words: D-E. L-I-C-I. O-U-S!! That’s it. This process makes it soooo easy to consume some awesome tasty veggies in a form in which you get SO much. It gives you significant vitamins and minerals and a ‘wallop’ of anti-oxidants, flavonoids and phyto-chemicals/phytonutrients and healthy fats which is the MOST underrated ingredient for successful weight loss! All these foods are great for cardiaovascular health, improve muscle retention and recovery and appetite control. In fact, when dinning in, I’ll eat my salad AFTER dinner. Not only does it refresh my palette, especially after a ‘rich’ filled meal i.e. typically any meat, fatty dish, etc;It suppresses the ‘sweet’ tooth! Which by the way is caused by meals high in Carbs, and low in fat and protein! I will save that for another blog, in the mean time, enjoy your salad!